Stock photo of the mountain goat statue atop the sigh for Mount Robson Provincial park along Yellowhead Highway (16) with Mount Robson and a clear deep blue sky in the background in British Columbia, Canada. 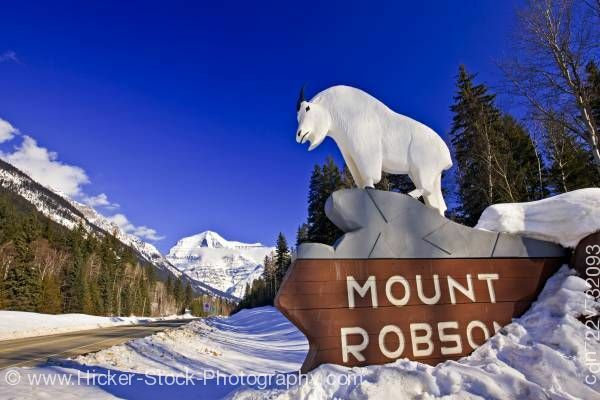 This stock photo includes the mountain goat statue that sits atop this large stone sign for Mount Robson Provincial Park along the Yellowhead Highway # 16 with Mount Robson (3954 metres/12972 feet) in the background, British Columbia, Canada. Mount Robson Provincial Park forms part of the Canadian Rocky Mountain Parks UNESCO World Heritage Site. Mount Robson Provincial Park's namesake peak is the highest in the Canadian Rockies at 3954 metres. Mount Robson Provincial Park is 217,200 hectares of stunning mountains, valleys, and waterways. Forests of spruce, fir, balsam, cedar and alder are home to an abundant array of wildlife including mountain goats, moose, deer, elk, marmot and squirrels and chipmunks. The Rearguard Falls of the Fraser River is the furthest migration point of the Pacific salmon.